Sorry about having another brief bout of blogstipation. We’ve finally managed to close on a house and now we’re probationary Texans (y’all). I’ve been spending the last week+ driving back to SE Idaho (by way of Best Friends, since we now have room to hire a second dog to hopefully keep Cornelia the Laser Dog company. I’ve got to lug 3 cats (and one goldfish in a small fish tank) a distance of 1600 miles or so starting in about 6-8 hours. Wish me (good) luck. After the weekend, I should have some time to get back to the real posts. The Mountain Dew Wine was virtually unfermented when I returned, even after sitting there 10 days, but since I’ve gotten back it’s started going. Still slowly – the bubbler spits out 3-5 bubbles ever 40 seconds or so – but it’s going. It’ll be interesting to see what I end up with. I wanted to do 2-3 posts on the effects of benzoic acid on yeasts (that’s the preservative in Mountain Dew®), and I would swear I had one or two others in mind. Oh, yes, and an update on getting a Magellan GPS replacement that can actually be used – they seem to have located a slightly lower-end model eXplorist that they can send me. I sent them back their “walled garden”-based Triton 500, so the replacement unit ought to show up next week, I think. Their service has been pretty good, at least. 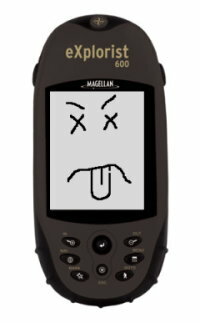 Well, the good news is that after calling their support line and trying the three-button-reset ritual that I hadn’t known about, my Magellan eXplorist 600 is still completely dead. They did not give me any hassle about replacing the unit, they just gave me an RMA number. My dead eXplorist was sent to their “Repair” center in Fort Worth, TX this afternoon. A replacement should arrive in about a week to a week-and-a-half. The bad news is that Magellan has discontinued the $350 eXplorist 600 (and the rest of the eXplorist line) and insists that they can only offer their newer $250 Triton 500 as a replacement. I’ll withhold judgement on whether to be ticked off at the $100 of retail value that is being lost here until I see the specifications. It looks at first glance that the basic capabilities really are pretty much the same, so it may turn out okay…except for the most important feature by far, which I originally chose the eXplorist for in the first place: documented data formats. The Triton series GPS’s appear to use a bizarre, undocumented file format, completely different from the documented format of the Meridian and eXplorist models. This means that as of right now, a Magellan Triton owner is not permitted to work with their OWN DATA without going through a proprietary, Microsoft-Windows-only GUI package, which ironically apparently uses GPSBabel to do file conversion. GPSBabel doesn’t support the Triton formats since there is no information available on how to read and write them yet. Since I have no Microsoft Windows machines anywhere, this means the shiny new Triton 500 (which I – seriously – can’t stop thinking of now as the “Magellan Vista”) will be nothing more than a highway map that requires batteries unless their proprietary “VantagePoint” software will run under WINE. I’m hoping that they’ve merely been busy and will soon get around to adding this units specifications to their “Interface Solutions” information. This is where the openly-published file format (and communication protocol) specifications which were highly (and rightfully) praised by the GPSBabel project are made available for the now-abandoned Meridian and eXplorist units. If the GPS data I work so hard to obtain remains locked inside the proprietary format, only accessible at the whims of Magellan and Microsoft, I’m going to be extremely peeved. If, on the other hand, GPSBabel soon gets the information necessary to add support for the Magellan Triton line, the only serious complaint I have with all this will go away. Honestly, if I can at least get enough documentation to write my own simple waypoint, track, and route reader for their Triton files I’ll be happy. I guess now I find out how good or bad Magellan, inc. is. A couple of months ago I traded up from my Garmen etrex Legend to a Magellan eXplorist 600. I wanted to get away from Garmin due to a couple of irritating limitations that they seem to cling to (like losing your timestamps if you save an individual track, lack of SD card support, and dropping NMEA data support “to support [their] software” [see the review in Make #1]). So far, I’ve been pretty pleased with the shiny new Magellan. Though their software (as usual) only works on Microsoft Windows, I didn’t buy it for the software, and GPSBabel handles the data conversion of the files just fine. So, naturally, now that I’ve just started blogging with the track data I’ve been recording with it, it has died on me. Yesterday – worked fine. Today – won’t turn on or respond in any way. The good news is that I DID register the thing online at Magellan corporation’s website, and it’s supposed to have a 1-year warranty. Support’s only available Monday-Friday, though, so I’ll have to wait until Monday to see a response to my support query. Wish me luck. I’ll post updates in case anyone is interested in how Magellan responds. In other news, “BigC” followed up on my previous queries about digital microscopes and Linux, saying that the manufacturer is now offering a Linux-compatible version of their AM311S model (the Linux-compatible one is the “AMU311S”) by special-order. Only goes up to 200X magnification, though, so it’s not real useful for my microbiological purposes. I can’t say the manufacturer of these digital scopes is impressing me much, but BigC certainly seems to be going out of their way to give good service. Posted on 2008-05-31 Categories Me, me, me, Meta-blogging, Microbiology, neogeography, Science History, The Big RoomTags customer service, gps, hardware failure, magellan, neogeography, supportLeave a comment on I guess now I find out how good or bad Magellan, inc. is. Bad Behavior has blocked 273 access attempts in the last 7 days.